The design for this project in Mill Valley stemmed from storm damage that wiped out an existing entry way and fence. 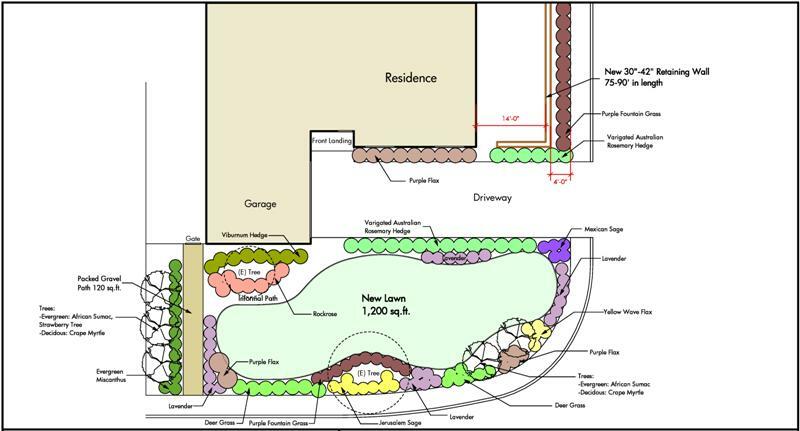 The design solution was a distinctive entry arbor that the owner wanted to highlight the entryway and replace the existing elements. 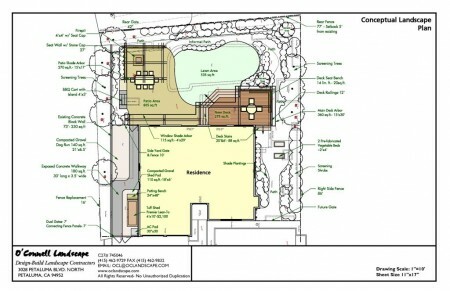 We are working on design development for this corner home in West Petaluma. 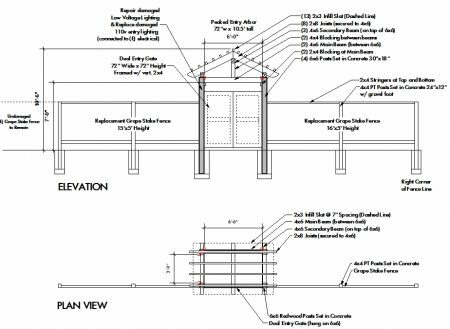 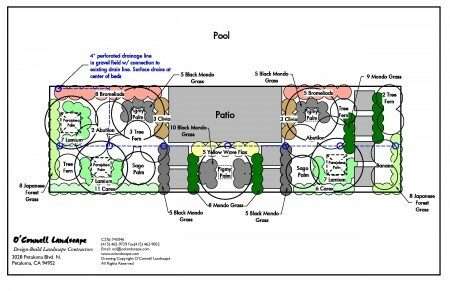 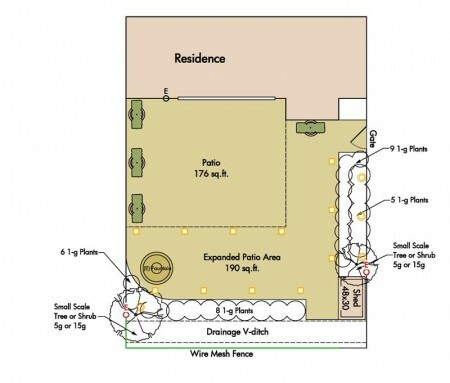 It is prominently situated on a corner lot, meaning the design incorporates a lot of new fencing. 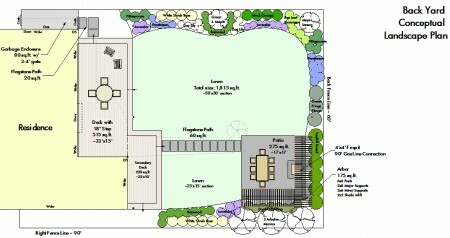 At one side we have detailed large shrubs that would create a green fence and expand the size of the back yard. 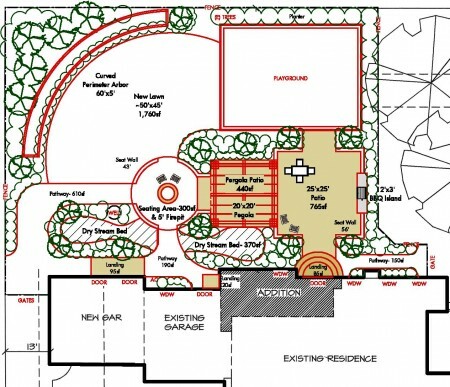 In the back yard a new patio, lawn and connecting walkways have been detailed for new living spaces. 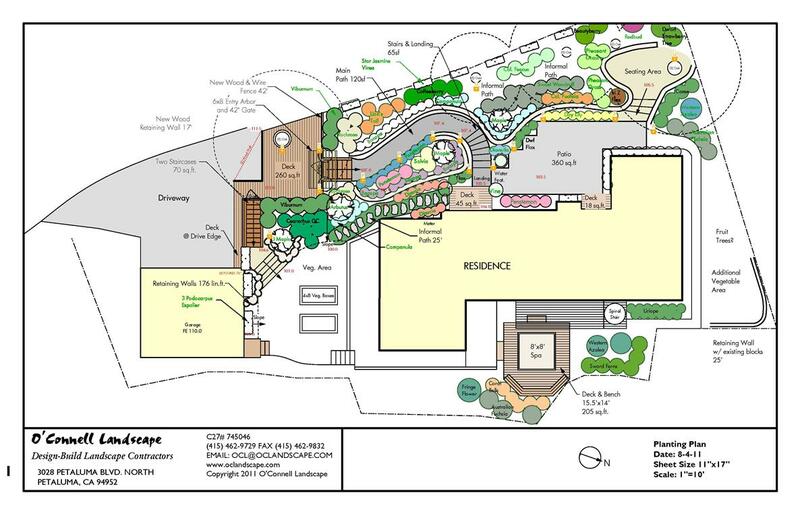 For this project just outside of town in East Petaluma, the challenge was creating a large scale entertaining and play space. 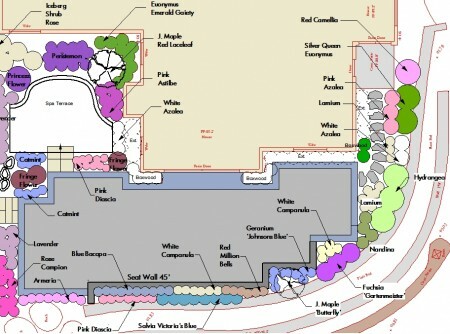 Working around an existing playstructure, a new series of spaces including a patio and BBQ area, pergola and firepit with integrated seating were purposed. 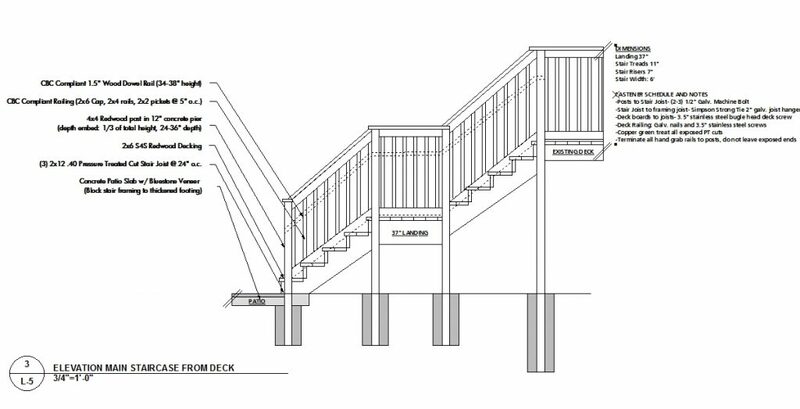 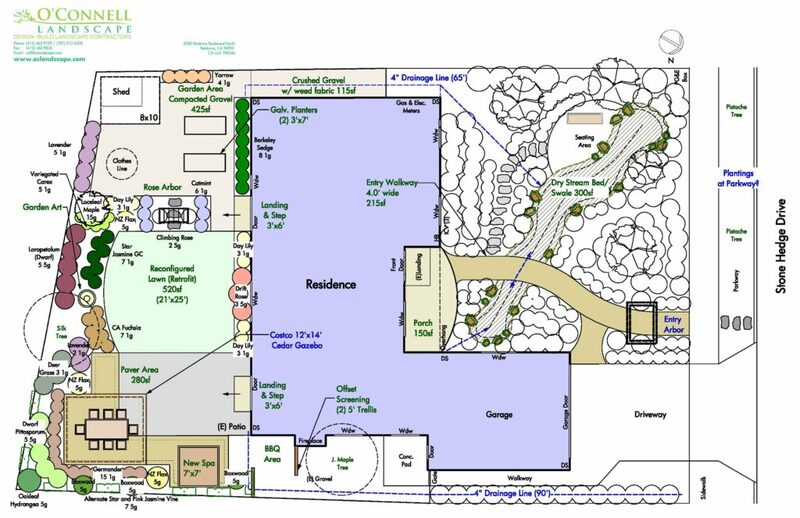 This design for a project in Tiburon took an small existing patio an underutilized hillside and transforms it into a large usable patio space with numerous amenities. 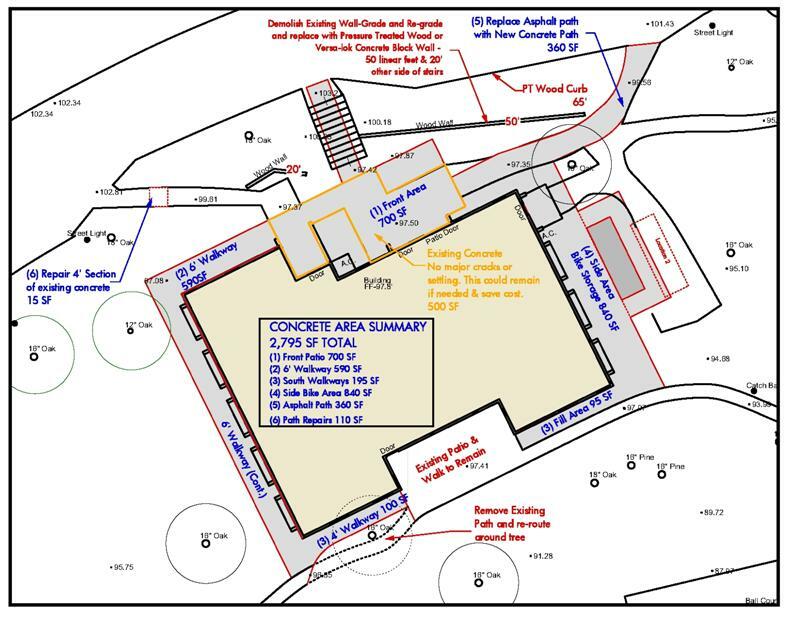 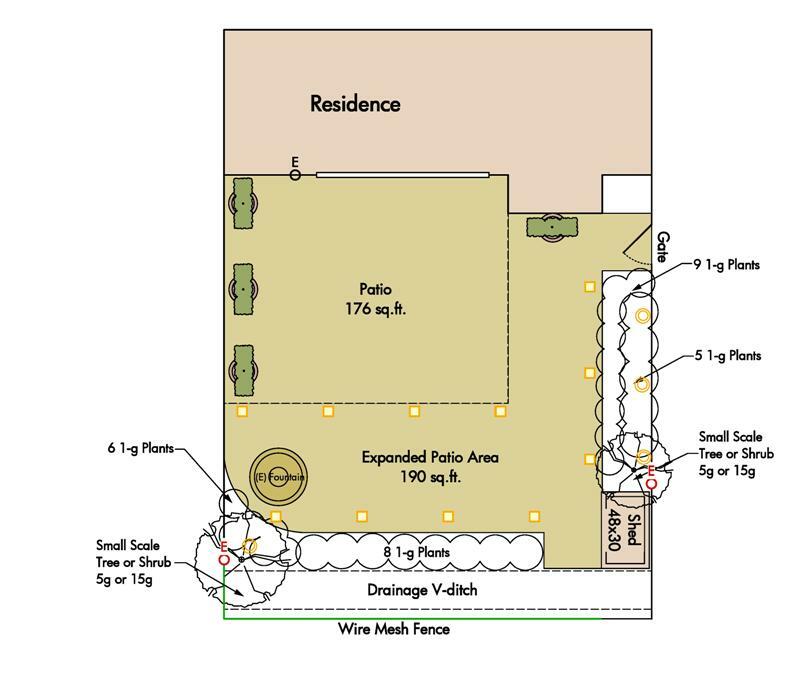 There is a sequence of spaces from dining, cooking and entertainment space at the main patio, to a bocce court and seating deck at the upper hillside to take advantage of views of San Pablo Bay. Here is an entry railing for a project in Mill Valley with a craftsman feel. 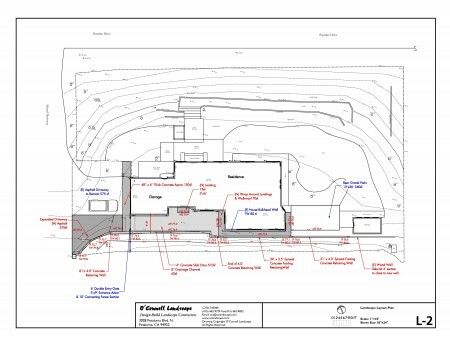 The existing entry is being redeveloped to create a more striking and usable entrance to the front door from the street. This layout for this fence was design to compliment a mid-century modern house with clean lines and a more contemporary design aesthetic. 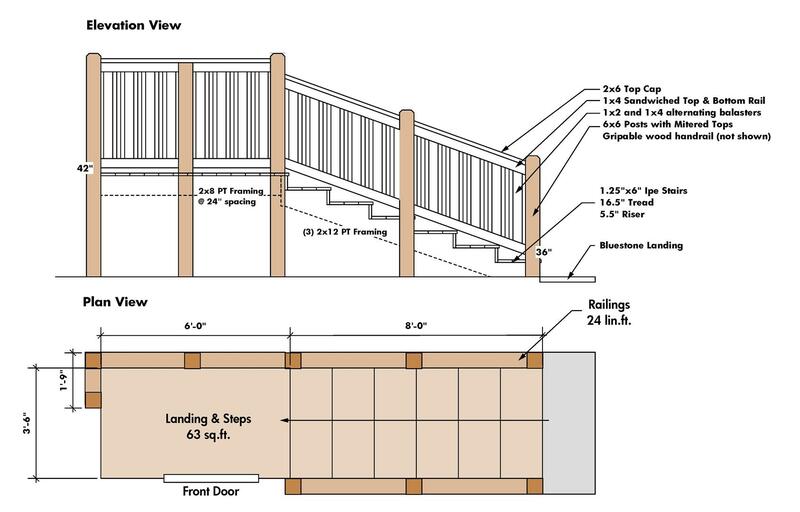 An integrated kicker board allows for stepped topography, while a sandwiched profile gives a good neighbor fence design on both sides. 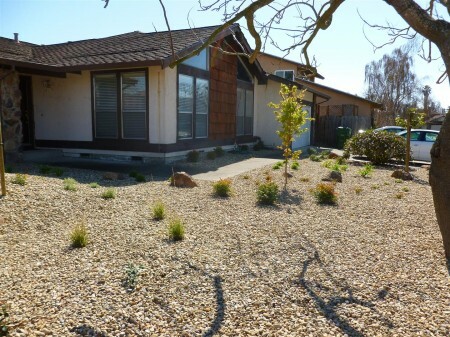 This project in Novato uses the concept of borrowed landscapes with native California and Japanese influences. 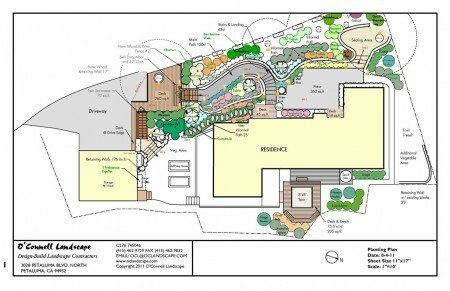 A zig zag boardwalk with ripples of grasses accent a planted water feature area in a twist on the traditional Japanese karesansui. 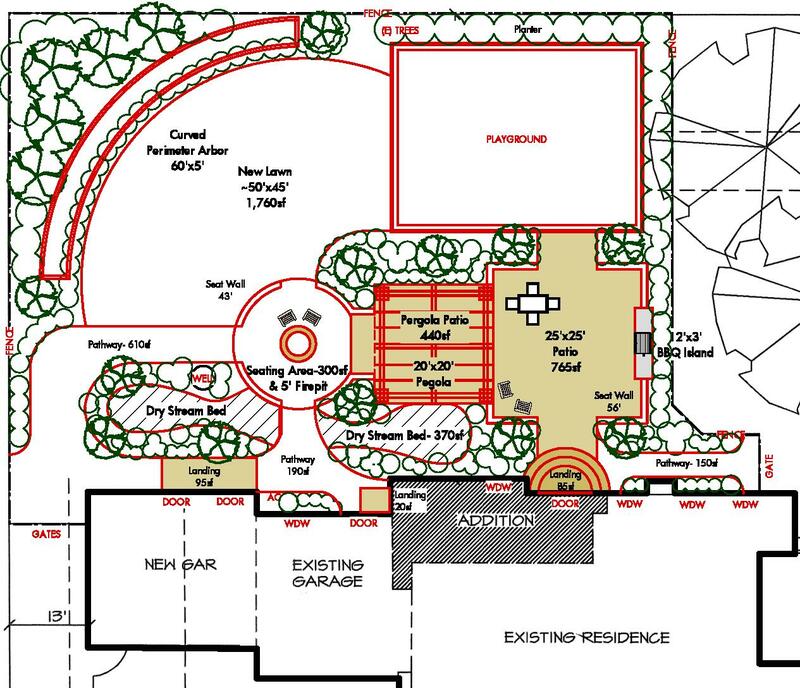 This entry gate in Tiburon combines a modern horizontally clad gate a side panels with a privet hedge to create a private entry. 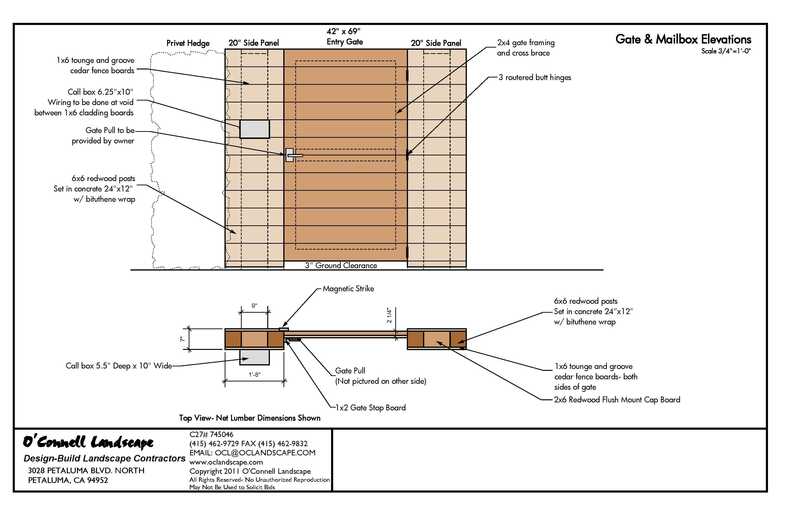 The new gate will be equipped with a call box and lock for remote entry access. This conceptual design for a back yard project in Novato focused on removing an existing pool and redeveloping deck and patio space. 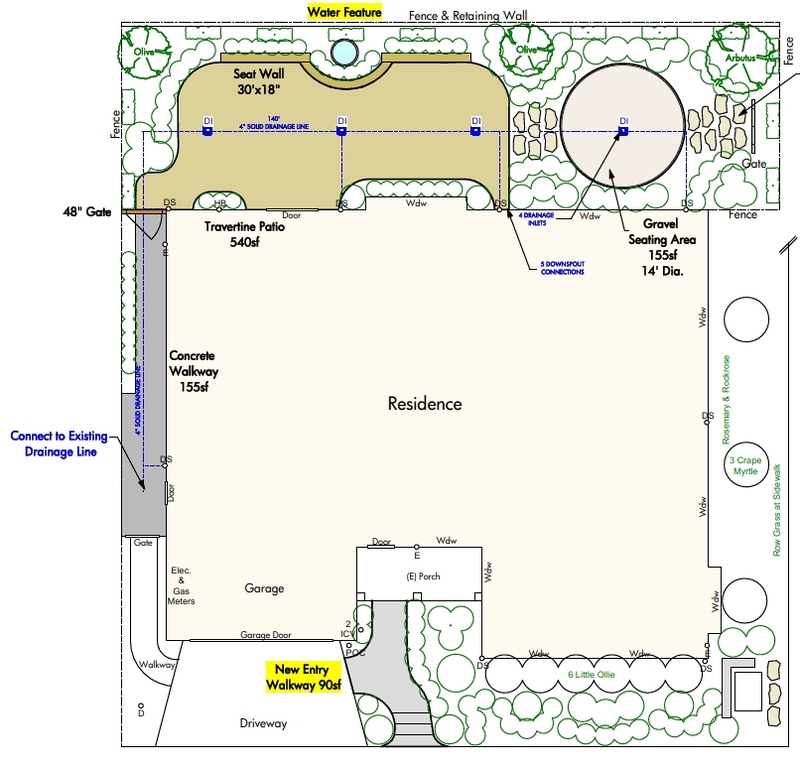 Of main concern was providing shade from hot sun and winds on this westward facing property, so fencing, screening trees and arbors were incorporated into the patio and deck to make the yard more usable year round. 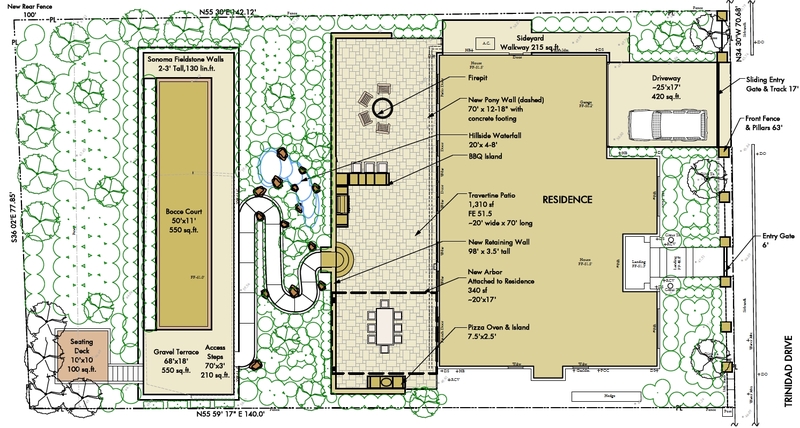 This conceptual design for a back yard project in Corte Madera took a boring and underdeveloped existing yard and created new living and entertaining areas. 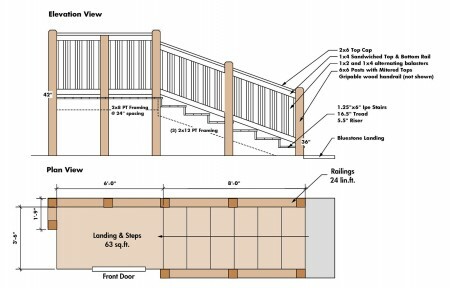 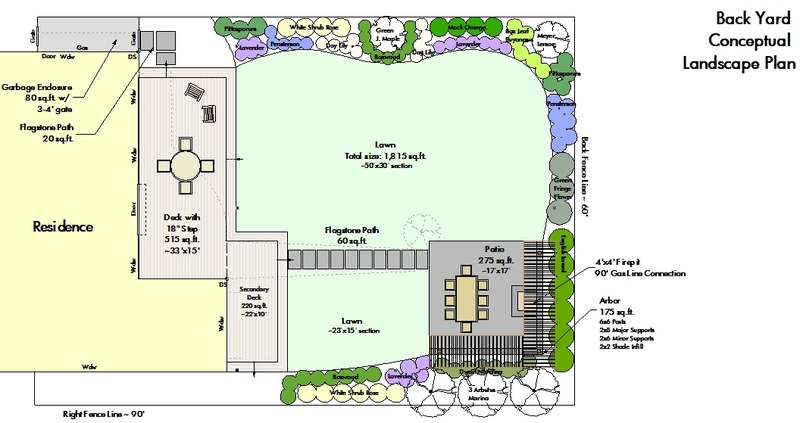 Focal points are a new composite deck, patio seating area with arbor centered around a firepit, and large lawn play space with sustainable sub-surface irrigation. 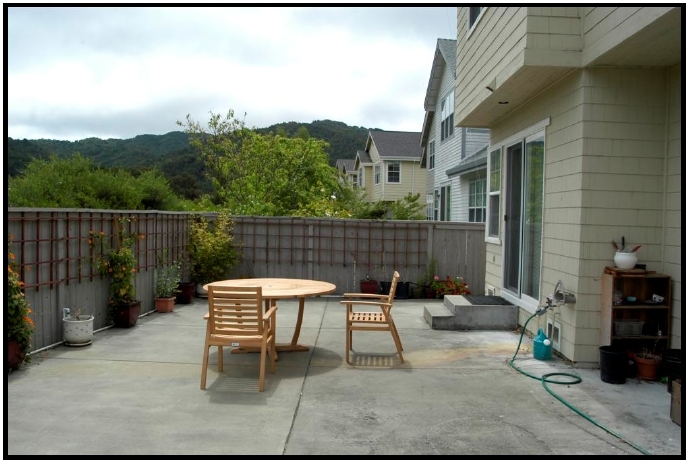 This project in San Rafael is a small backyard patio that had the unfortunate distinction of being completely covered in concrete. 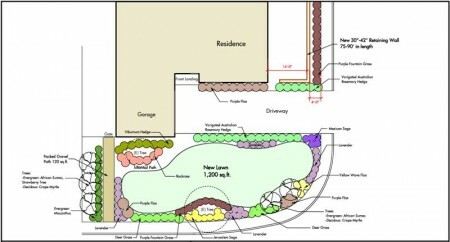 This concept devises a solution that leaves much of that concrete in place, surfacing a portion of it with new flagstone and building a new Trex deck to better transition from a set a sliding glass door. 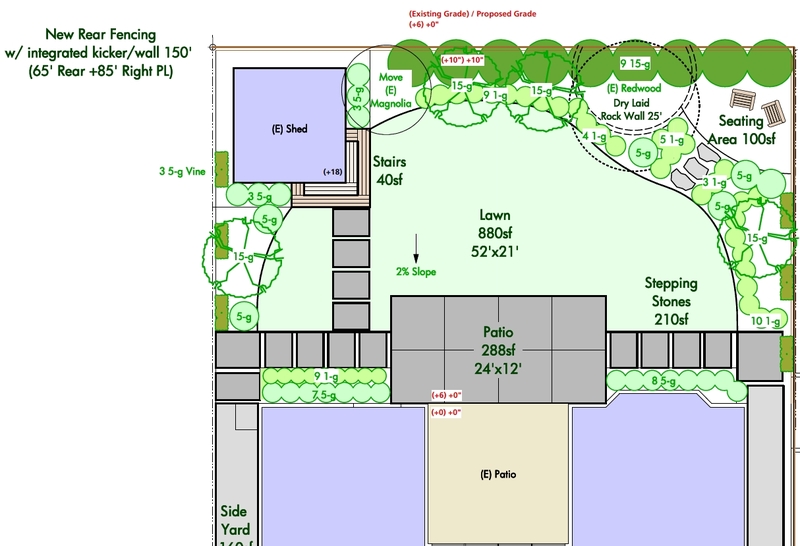 The rear perimeter of the yard will be saw cut and demolished to create a new planting bed. For this Mill Valley project under construction the owner wanted plantings that would provide showy color in a vibrant palette of reds, pinks and purples. 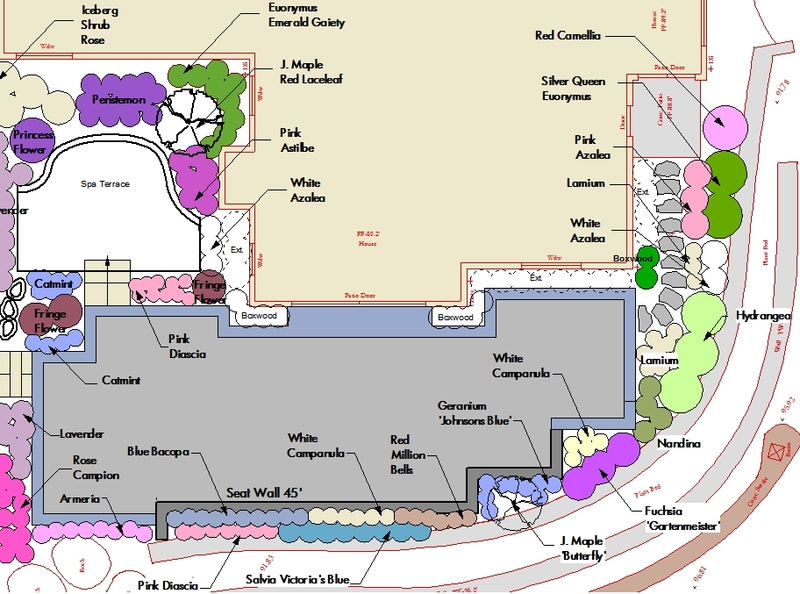 We integrated a number of hardy blooming perennials such as Rose Campion, Lavender, Blue Bacopa, Blue Salvia, White Campanula, and Geranium Johnsons Blue, to compliment the installation of a dark gray concrete patio with flagstone accents. 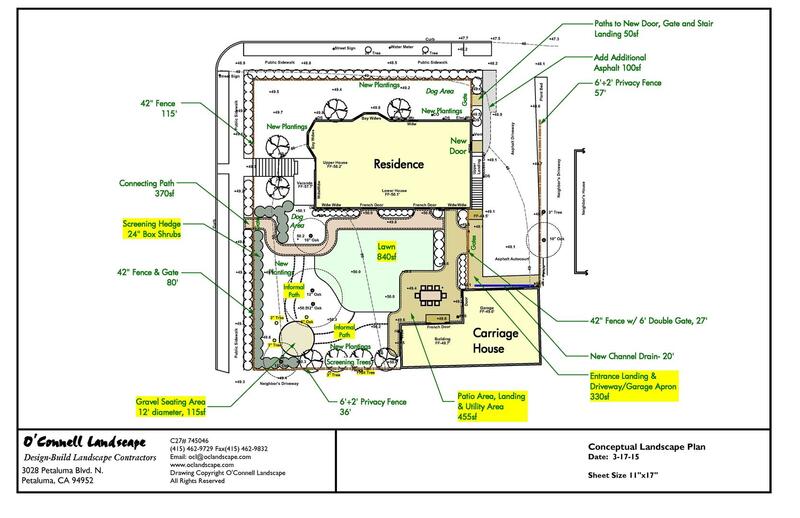 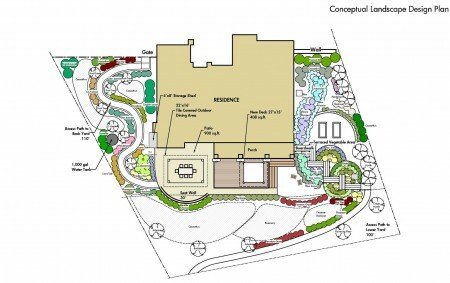 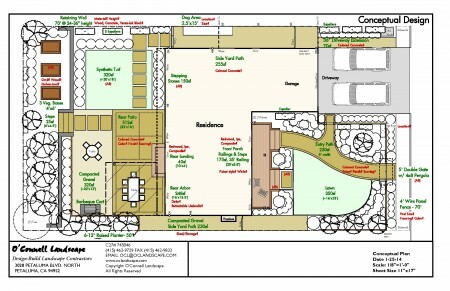 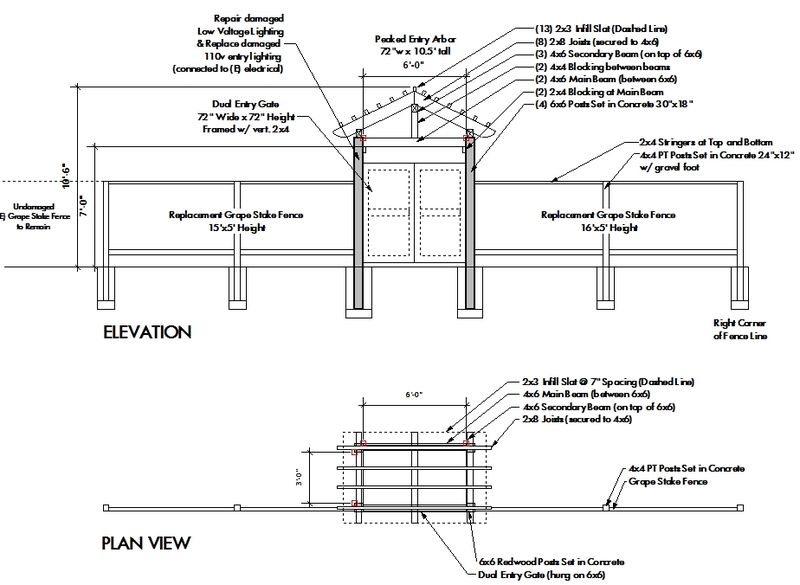 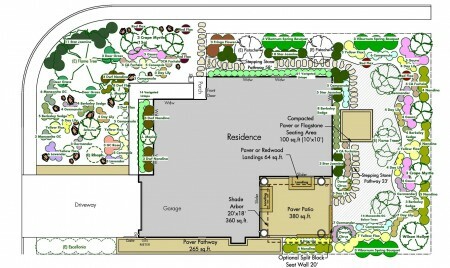 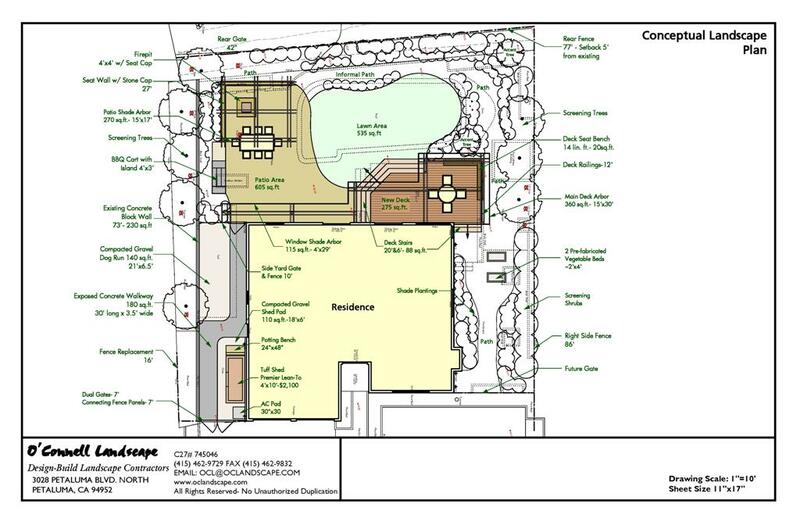 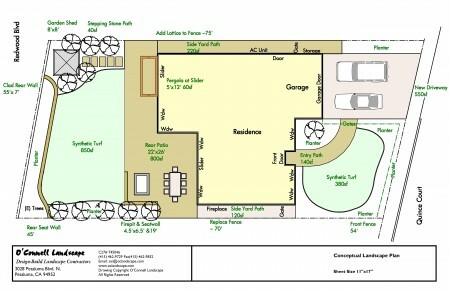 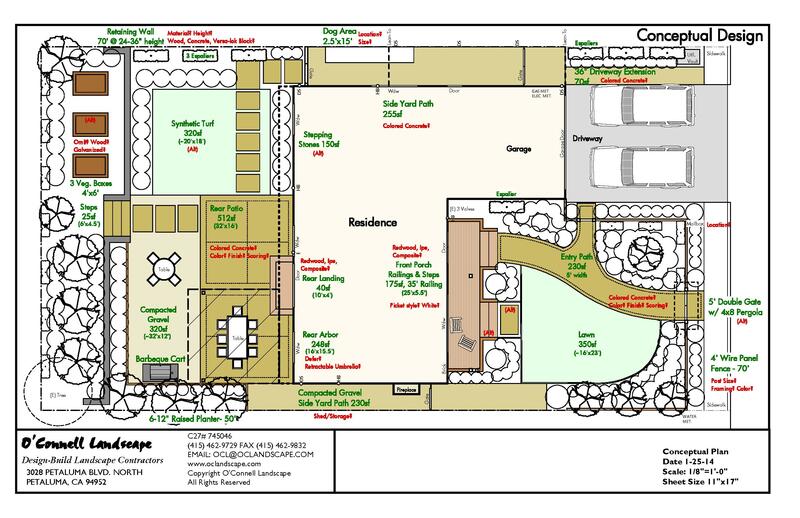 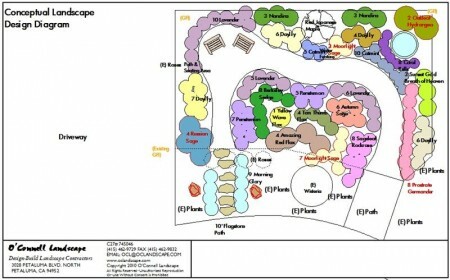 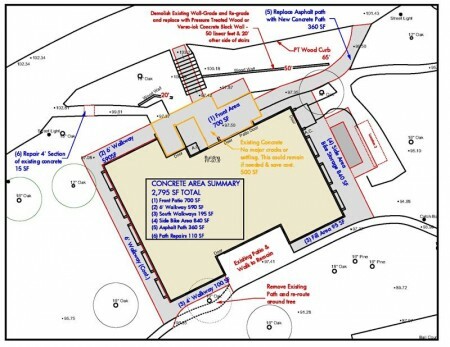 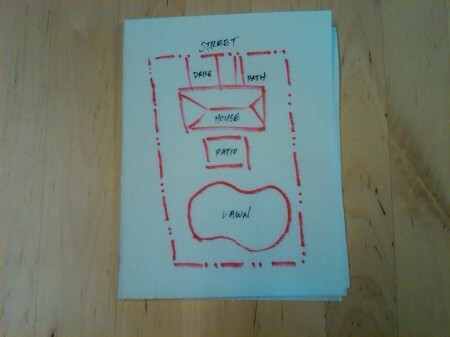 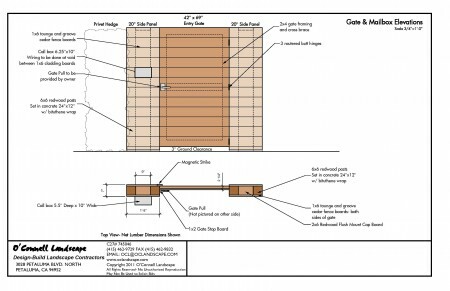 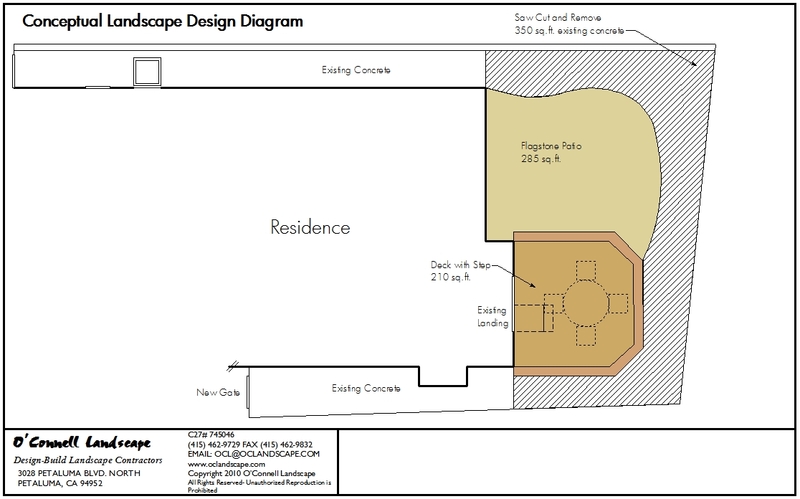 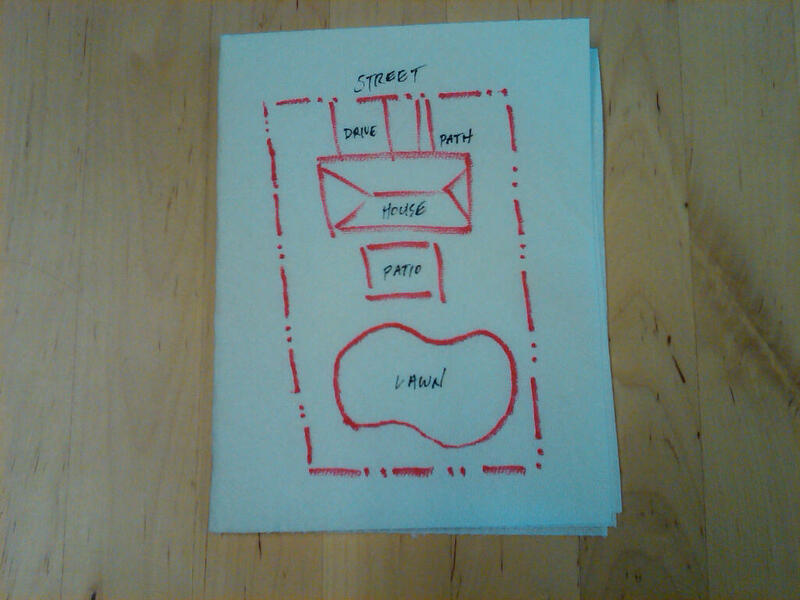 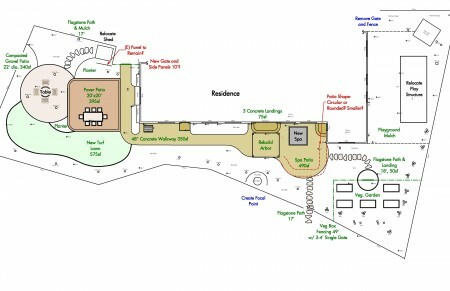 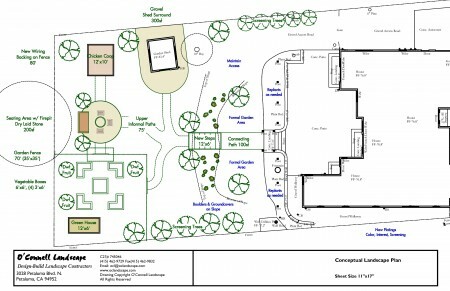 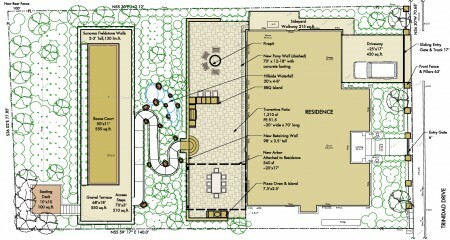 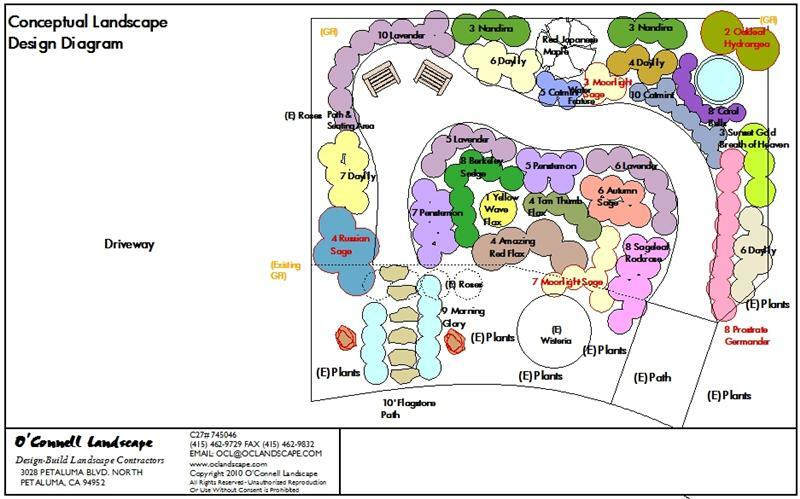 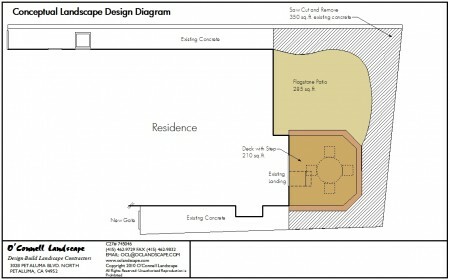 We are working on an intimate back courtyard for this project in Novato. 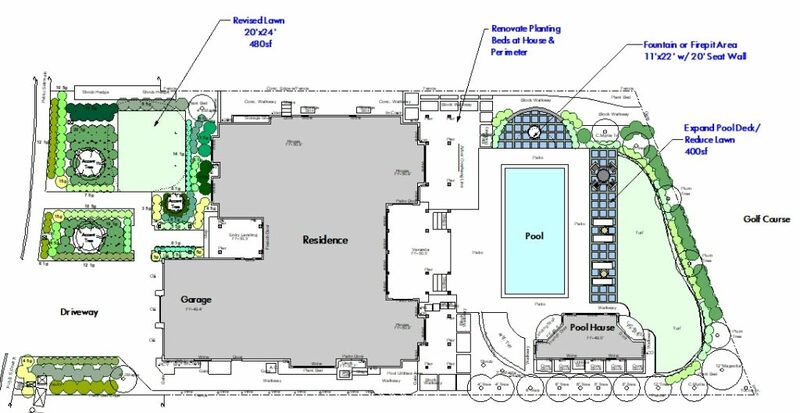 The new design expands the existing patio area, creating an outdoor room with integrated lighting, border plantings and fountain accent.